Homologous recombination is a very rare event, and scientists using it to modify or "knock out" mouse genes must identify the cells in which it has occurred. In addition to injecting the gene they are trying to incorporate, scientists also inject "selectable" genes whose products permit cells to live or cause them to die in the presence of a particular drug. The two most common selectable genes used in gene targeting are the neomycin resistance (neor) gene, which allows cells to survive in the presence of the antibiotic neomycin, G418, and the thymidine kinase (TK) gene from the herpes virus. Cells with this gene die in the presence of the antiviral agent gancyclovir. The neor and TK genes are generally used together for maximum selection. 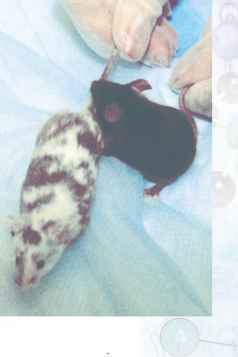 The first step in gene targeting is to clone the gene that is to be replaced from the mouse genome. The cloned gene is placed into a targeting vector along with a selectable gene such as the neor gene. (The targeting vector is a larger piece of carrier DNA.) When the targeting vector lines up with the native mouse gene and homologous recombination stitches the genes in the targeting vector into the genome, the neor gene will be included. By adding G418 to the cell growth media, only those cells that have incorporated into their genome the transgenes, including the neor gene, will survive. This is referred to as positive selection, selecting for cells that contain the desired integration product. Chimera generated by injecting RW4 ES cells Black mouse is a littermate control. blastocyst early stage of embryonic development into the genome the entire vector is inserted and the TK gene will be included. The addition of gancyclovir kills all cells that have the TK gene, thereby killing those where the insertion was random. The combination of positive neor selection and negative TK selection results in the survival of only those cells containing targeted gene replacements.